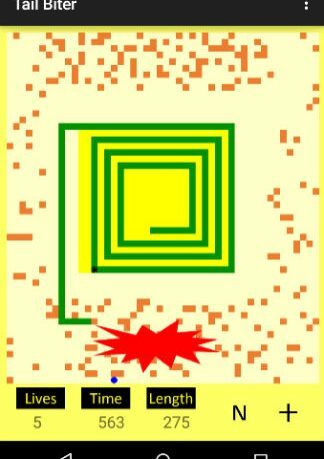 Remember Snake, the simple yet incredibly addictive early mobile game that dominated your time on Nokia phones? Well the game has been converted and cloned on just about every platform ever released, including a few versions for Android. The latest is Tail Biter Snake, available for free from the Google Play store. The game has a different twist on the usual formula, which makes it stand out from the crowd. This is still essentially Snake, so you control the titular creature around the level, with the basic idea being to avoid the head of the snake colliding with its extremely long body. You would usually have to get the snake to eat items around the level, increasing its length, but here the aim is to avoid colliding with any of the many obstacles around the level, in addition to the body. The length of the tail is set, although it does get longer with each level, and the core idea is to get the snake to bite its own tail. The lengthy creature will start inside a yellow box, which is also the area where you swipe around to control its movements, and you must first get it to eat a blue egg, which is invariably in a difficult to reach place. Then you must find a route around the level so that you can eventually find your own tail, when it does appear. This means that far more planning is required in each stage, as just avoiding the obstacles is not enough because you will eventually trap your self or make it impossible to find the tip of your tail. 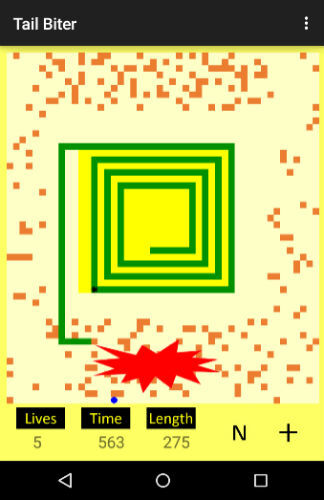 Snake is often difficult on a touchscreen, but the design decision to make the game more about planning and less about reacting, combined with the clever use of the yellow area, means that this is the most playable Snake game yet for Android. The visuals do let the game down a bit as they are incredibly simple, even for my own retro taste, although the limited range does help to keep things clear. Given the simple look, I would really like to see some alternate colour themes introduced to keep the visuals interesting. 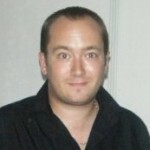 The game is free to download and play, with the first level included for free, and a small fee for each level following that one. Despite the basic looks, this is probably the best game of Snake that I have played on a touch screen, with a neat twist to the gameplay mechanics and very decent controls. If you are looking for a genuinely good Snake game for your Android phone or tablet, this is probably the best of the bunch.